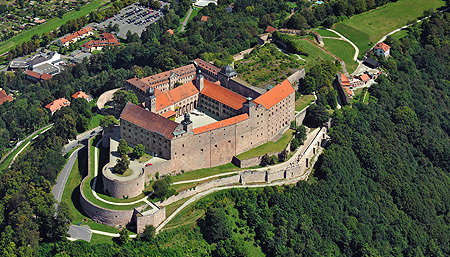 This massive fortress belonged from 1338 to 1791 to the Burgraves of Nuremberg and subsequent Margraves of Brandenburg, members of the Hohenzollern family. In 1559, Georg Friedrich von Ansbach commissioned Caspar Visher to build a four-winged complex. The Schöne Hof (Beautiful Courtyard), an arcaded courtyard richly decorated with relief work, is one of the finest examples of German Renaissance art. Further highlights are the museum "The Hohenzollerns in Franconia", the "Frederick the Great Army Museum" (Windsheimer Collection) and the Margravial Rooms with historic pictures of the construction work, portraits of margraves and the gilt canopied bed of Margravine Maria (around 1630). 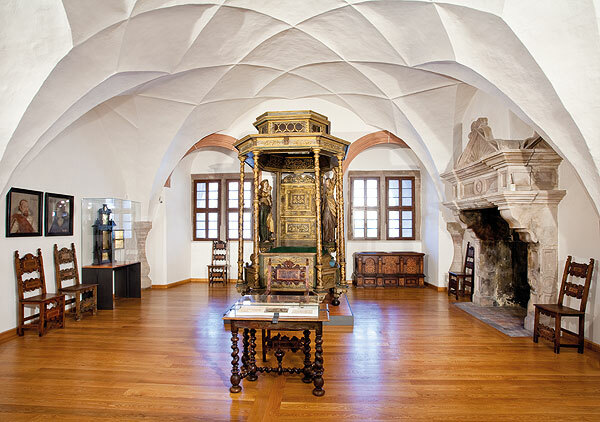 Further information on the museum "The Hohenzollerns in Franconia" and the "Frederick the Great Army Museum"
The castle church is suitable for religious services, weddings, christenings and concerts up to 199 persons. The Beautiful Courtyard is suitable for concerts, lectures and receptions up to 1,500 persons. Guided tours (in German) on the Margravial Rooms and the Museum "The Hohenzollerns in Franconia"
From Bayreuth: Bus to "Kulmbach/ Busbahnhof"